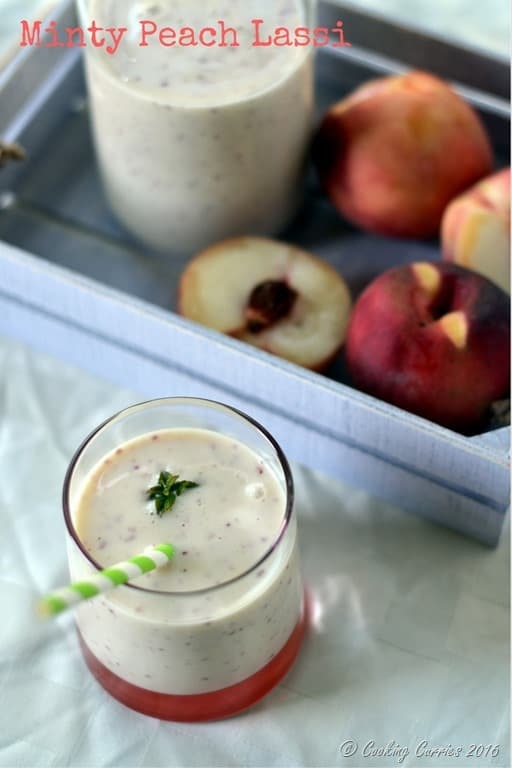 Creamy yet refreshing Minty Peach Lassi with a touch of honey for sweetness, it is the perfect summer drink, especially when peaches are everywhere this season! What do you do when you have a little extra, ok a lot extra, of peaches that you went crazy over at the local farmer’s market. You eat some. You make some lemonade. Maybe, you grill some and top with vanilla ice cream for a summer night dessert. And you make some lassi. Yes, thats what you do with those glorious peaches that are there everywhere in abundance this season. Honestly, I love nectarines over peaches. Simply because the fuzzy skin of the peaches sometimes gives me the ickies. But I love the flavor and love to eat the fruit, as long as I am not examining the skin a lot and it especially helps if I am not cutting the fruit. I had some kefir sitting around in the refrigerator, so I mixed it in with the yogurt to make this lassi. Kefir is also fermented milk but it is fermented with “kefir grains” that is a yeast/bacterial fermentation started (source: wiki) I find it taste sort of in between to buttermilk and yogurt, more of a sour-ish buttermilk. You can just use plain regular yogurt for this. 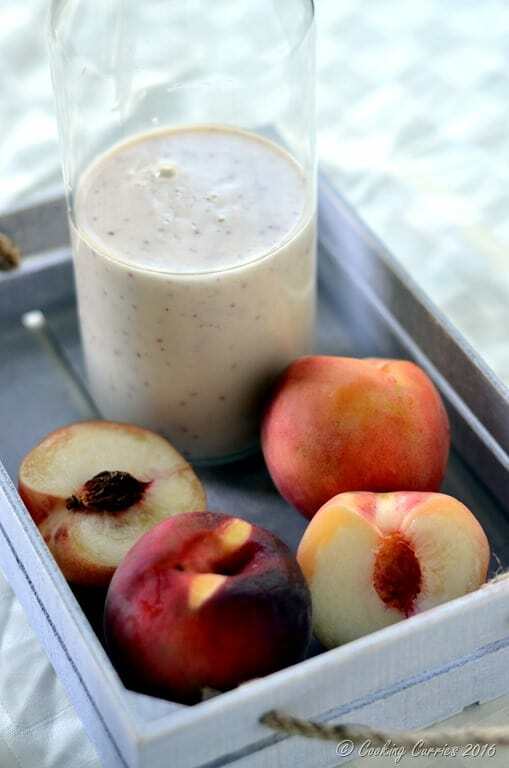 Use fresh, ripe peaches for this to get that beautiful fragrance and flavor. I have used white peaches here, but if you love the yellow ones, you can use them too. It might give a gorgeous yellow color to the lassi! This can be made ahead and refrigerated for a couple of days. Did you know peaches is one of those fruits where pesticides are used a lot and it kinda sticks to the skin long after it is washed. It is part of EWG’s (Environmental Working Group) Dirty Dozen – all produce which is highly reccomended that you buy organic. If you do want to get in to the whole debate of there being pesticides in organic produce and just because they are organic/natural pesticides and not synthetic does not make them not-pesticides, then feel free to go ahead and research. I do read up about these things quite regularly and it is always good to take everything with a pinch of salt. If you want my opinion on this, I prefer to buy most of my produce organic except for bananas, avocadoes, mangoes – basically most things with a peel that can be take off, are ok for me even if they are non-organic. I do however want to minimize any exposure to nasty pesticides used in produces and I believe from my researches that even though organic farming does use natural pesticides, that they are at least safer than your synthetic pesticides. Wash and pit the peaches and chop them up roughly. 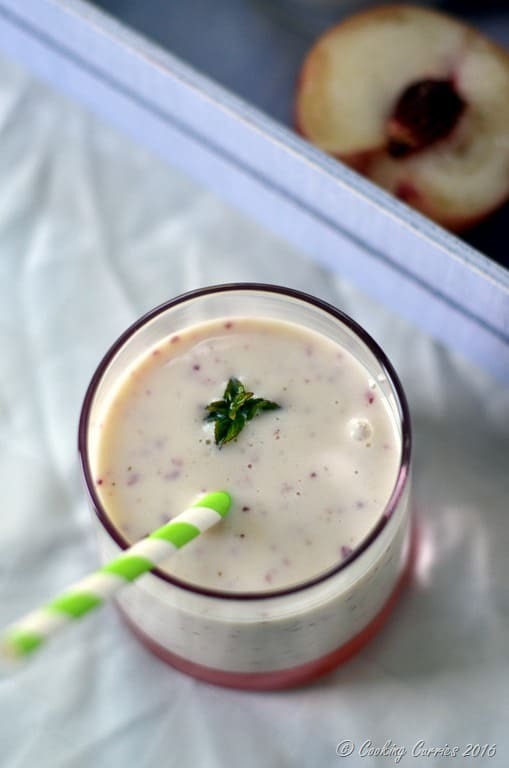 Put all the ingredients in a blender and blend to a smooth lassi. Serve immediately or chill in refrigerator for some time. 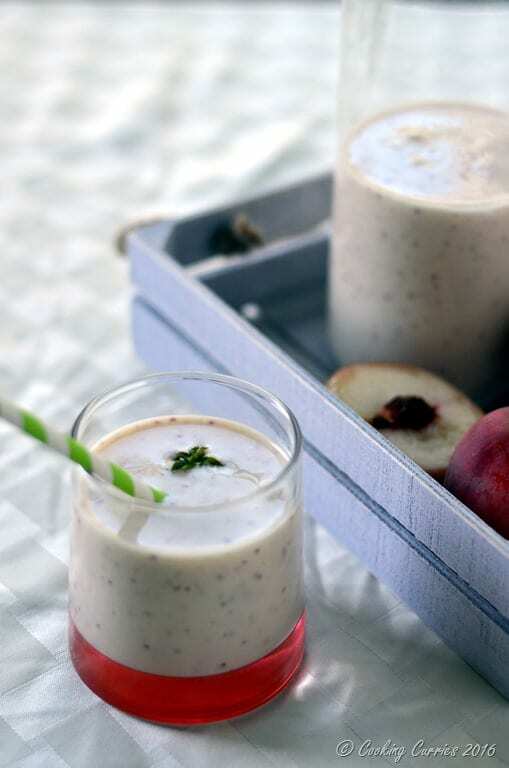 Minty Peach Lassi seems so refreshing! Also, I concur with your point of buying Organic Food. The company I work for, OrderZapp is also into Organic, 100% Natural health food. Organic food at least does much lesser damage than processed food. Thanks manju for sharing this unique recipe.. 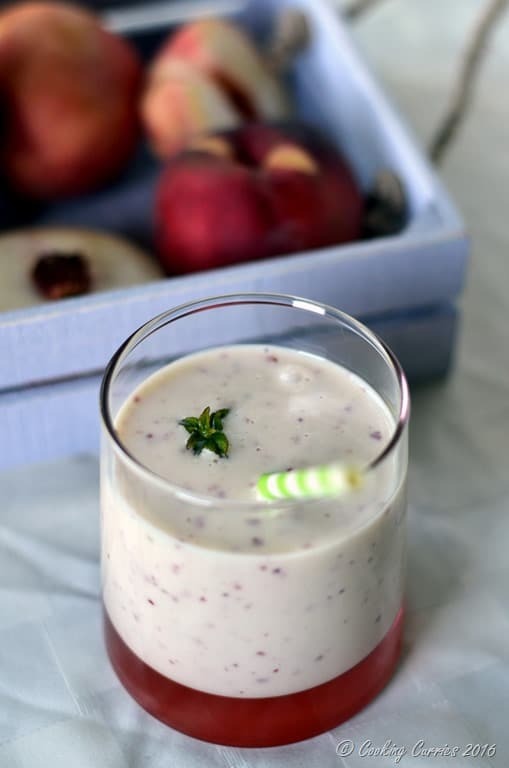 I never thought something like peach lassi could be made..